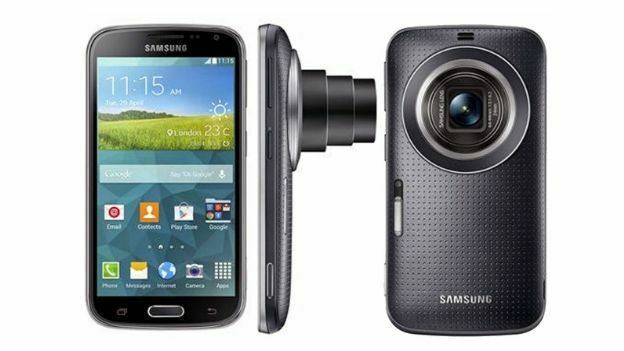 The camera-keen Samsung Galaxy K Zoom goes on sale in the UK today online and in selected stores. The Samsung Galaxy K Zoom has gone on sale in the UK today, offering budding photographers a whopping 20.7MP camera with a 10x optical zoom. The 4G Android phone also packs a 4.8-inch 1280 x 720 Super AMOLED display and a "Hexa core" processor that is made up of 1.3GHz quad-core and 1.7GHz dual-core processors. It sports Android 4.4 KitKat out the box, 2GB of RAM and has 8GB of internal storage with a microSD card slot for extra storage. Unlike last year's sluggish Samsung Galaxy S4 Zoom which also sported an impressive camera, the new one aims to offer a more complete device. "We're excited to introduce the Samsung Galaxy K zoom to the UK market, giving our customers the convenience and connectivity of a Galaxy smartphone with a professional grade camera for a unique, all-in-one mobile experience," said Simon Stanford, vice president of Samsung UK's IT and mobile division. The camera's professional qualities are obviously the main selling point for any one that is looking to take high quality photos/videos on-the-go. The rear also includes a xenon flash to illuminate scenes more brightly than a vast majority of other smartphones that use LED flash units. The Samsung Galaxy K Zoom is available today from the official Samsung Experience Stores and other high street stores including Carphone Warehouse. You can grab the Galaxy K Zoom for free on monthly contracts starting at £38 per month and it's also available SIM-free for £400 from the Samsung eStore. Watch our Samsung Galaxy K Zoom video below.